The Optoelectronics Company is delighted to announce that USHIO OPTO SEMICONDUCTORS, INC has launched two single transverse mode 639nm laser diodes with built-in photodiode for optical output power monitoring in industrial applications: the HL63391DG and HL63392DG. 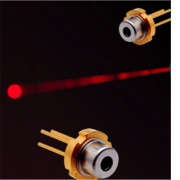 Combining an output power of 200mW with 12% lower energy consumption, these new red laser diodes offer excellent directivity and narrow monochromaticity in addition to their small size, (housed in a 5.6mm package). They are suitable as light sources for a variety of optical applications such as laser levelling, distance measuring, position sensing and numerous medical applications. The HL63391DG and HL63392DG consume 12 per cent less power than equivalent conventional USHIO diodes due to an optimised laser structure, active layers and facet coating. They offer typical optical and electrical characteristics, (Tc=25 degrees C, cw), of 65mA threshold current, 0.8mA monitor current, low operating current of 255mA, low operating voltage 2.8V typ, 8.5 degrees beam divergence parallel to the junction, 14 degrees beam divergence perpendicular to the junction, laser diode reverse voltage of 2V and operating temperature of -10 to +60 degrees C. They are selectable from 2 types of internal circuit which are cathode common (HL63391DG) or anode common (HL63392DG).